Close to the Leuvehaven, this centre benefits from a prime location in Rotterdam and offers both private offices and co-working spaces for maximum flexibility. An on-site team will meet and greet your guests while meeting room access is also available. This space comes with administrative support, 24-hour access and security, secure on-site parking, air-conditioned offices- all at a prime location! A modern centre situated in a lovely area of Rotterdam, providing furnished office-space solutions available on flexible terms. The work-spaces benefit from plenty of natural light and high-speed internet. Reception services are also featured on-site who are able to assist with administrative duties. The location is ideal as well, surrounded by convenient transport routes and plenty of local amenities. Consisting of both private office spaces and coworking spaces with options for a dedicated desk this new centre is located in the heart of Rotterdam making it well connected for commuters. Meeting rooms also available as are an on-site team to welcome you and your guests. This space also offers telephone answering services to help your business run as efficiently as possible. Close by, there are hotels, restaurants, events venues and lots of cultural hot spots to explore and enjoy! At this full-service business centre you can rent fully-equipped office units, including furniture, high speed internet and telephone. Parking and service charges are included. This ‘lively’ business centre has a central reception with a fixed point of contact and a modern decorated lounge with a coffee corner and a pantry. You can use the standard services, including reception and referral of your visit, parking at our own car park, security, service charges and cleaning of the public areas. Our telephone and postal service is also included. Just a stone's throw from Rotterdam Central station, this modern innovative business centre offers dynamic work areas flooded with natural light close to the newly renovated, Hofbogen. Its imposing concrete structure with large glass windows offers an excellent vista point over the city of Rotterdam and the Maas River, with views extending as far as Delft. Here, you can access the centre 24 hours a day. Housed in a brand new office complex in the city's most important out-of-town commercial district, this centre offers a range of facilities including a cyber café, on-site lunch restaurant and disabled facilities. There is administrative support on site to help your business run as smoothly as possible, while you focus on the bigger projects. Located right next to the A16 ring road and close to the underground station Kralingse Zoom; the centre offers unrivalled accessibility. Found in a prestigious and well-known area of Rotterdam, this business centre is located in a convenient area which can put you and your business in an excellent location. The centre offers modern, spacious and innovative work stations which benefit from great services and ample local amenities. The centre is eco-friendly with solar panels and smart technologies. There are on-site refreshments, customer parking options and video conferencing facilities. The airport can be easily reached by car and the centre is only a stones throw away from the Alexandrium shopping mall. This centre is close to a range of local restaurants and hotels, and offers east road and rail access to Rotterdam and The Hague. The centre offers a range of office solutions to suit your specific needs, as well as a full selection of business support services. And, of course, if your work takes you into the city, you’re just a short trip away from Rotterdam and The Hague by car or public transport. An impressive business centre situated in Rotterdam, providing a range of furnished office-space solutions available on flexible terms at affordable rates. Here, tenants can make use of the high-speed internet, business lounge, meeting rooms, videoconferencing and virtual office options. In addition, the area is home to many local amenities, including great places to eat and drink. Public transport links are also convenient and circulate the area frequently, providing easy transport in and around the city and wider regions. This co-working space is located in the heart of Rotterdam, at the most vibrant street in the city, named Witte de WIthstraat. You’ll be surrounded by like-minded people with whom you connect on a professional and personal level. Flexible membership plans are tailored to your needs no matter the size of your company. Members of the space vary rom VR innovators to next-gen platform builders. 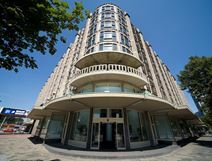 This outstanding centre is a three-minute walk away from the Beurs Metro station, and it will take you seven-minutes to get to Rotterdam's Central Station and five-minutes to Blaak Station. Located in the city of Rotterdam this business centre offers an impressive 300 workstations, over 10 meeting rooms and a meeting space with capacity for 5000 people. There is also an on-site restaurant with 200 seats, a coffee roasting factory and on-site cafe. Supermarkets can be found nearby with everything you may need during your working day. Workspaces are fully equipped for your use, with stylish design and furnishings and access to the fastest internet in the country. You can also work on the go with your membership giving you access to 6 more locations across the country. This architectural landmark is situated in a fantsastic area, settled within Rotterdam's business district. It is home to several major multinational companies including Unilever and Nationale Nederlanden. The centre offers an on-site lunch restaurant, a videoconferencing studio and secure parking spaces. In walking distance for public transport links and just 20 minutes from the city's international airport. The building houses a barber, nursery, mini supermarket, physiotherapist, repro service, fitness center, restaurant and so on. To cap it all there is a roof terrace of no less than 7,000 m2 which is accessible to all tenants. Also, the famous Koopgoot is easily reached. A perfectly accessible location by train, bus, subway, tram, Light Rail, High-Speed Rail and car. The car park offers ample parking for tenants and visitors. This new business centre is located right beside Rotterdam Centraal, allowing for easy access to other areas of the city and country. The centre offers fully furnished offices with high-end furnishings, modern coworking areas and virtual office options through which you can benefit from a prestigious business address. The centre also has an on-site bar, fully equipped meeting rooms and video conferencing facilities. Meeting rooms are decorated in beautiful, bright colours to keep them looking inspiring and unique. Located in the business area of Rotterdam, this business centre finds itself in an impressive and modern tower, placing you and your business in a highly convenient location. The centre offers fully equipped, spacious and bright offices on flexible terms and at affordable rates. All work stations benefit from great in-house services including comprehensive reception services, access to modern meeting rooms and an espresso bar. The location is convenient with plenty of public transport links around you including buses, the tram, underground and easy car access with parking facilities. This work-space solution is highly desirable for many companies, owing to its abundance of facilities and support services that will enable businesses of any background to flourish! This centre is located in close proximity to Rotterdam Central Station, with great connections by rail and road to Belgium and France. The building offers excellent office accommodation on flexible terms to suit your requirements. Located in the heart of Rotterdam, just beside the city centre, this stunning building provides a range of work spaces including private offices, dedicated desks, hot desks and virtual office options. The centre offers a range of facilities and amenities on-site including refreshments. Workstations are fully equipped and ready to use, so you can start working straight away. With flexible terms and affordable rates, it is the perfect place for entrepreneurs to join a thriving community. The centre is easily accessed using public transport and paid parking options can be found around the building. Located in an up and coming area of Rotterdam, this business centre is found in a prominent and prestigious tower building part of the Rotterdam skyline. The business centre offers a range of office solutions, access to modern meeting rooms and flexible terms. The rates are affordable and offices vary in size, ensuring to meet the needs of your organisation. The centre benefits from great local public transport links and there are plenty of amenities on offer right on your doorstep. Close to the Rotterdam Airport and the CBD, these stunning offices are right next top the Archimedes Bridge and provides stunning views of the Rotterdam skyline. On the First floor you find inspiring workplaces, such as coworking and flexible workstations, all with the highest level of innovation and technology. The Wilhelmina location also has direct connectivity to the network of fast-tram-lines in the area. Metro Line E with connectivity to all major lines within 1 stop is situated at the entry of the building. This work space solution is perfect for companies of any background, and offers virtual office options for optimum versatility. At this centre, you can benefit from cutting-edge facilities as part of a hotel infrastructure; such as casual breakout sessions, world-class gym and late-night bar/restaurants. In addition, this centre is accessible 24/7 for your convenience. Close by, you can find many eateries and a botanical garden.